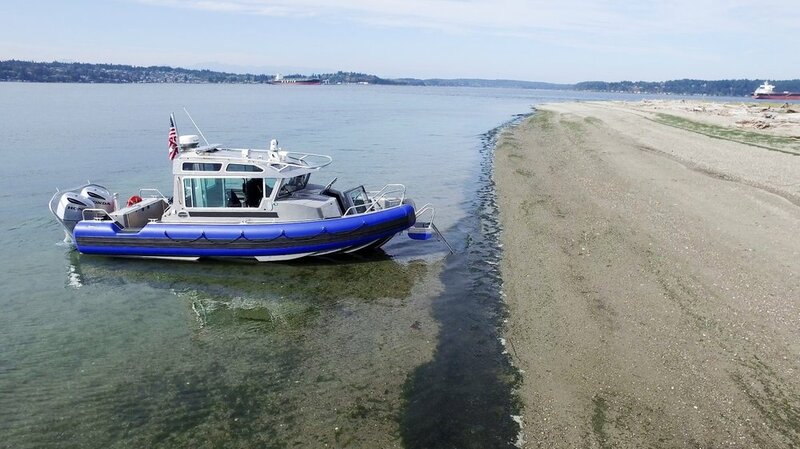 LIFE PROOF BOATS constructs all of our vessels within the Bremerton Industrial Park, located in Washington State. We have expanded within three facilities and have approximately 30,000 square feet of total manufacturing. We utilize a dedicated facility for welding, a separate dedicated facility for all of our collar manufacturing and upholstery, and a third facility which is dedicated to rigging. The west wing in our rigging facility. Our shops are near other boat manufacturers and very near the Bremerton National Airport along Highway 3. We are 1-hour from the Seatac International Airport by car and 1-hour from Seattle via Ferry. Because we our boats are used in the toughest of environments, they are built stronger. That is why we only use 5086 H32 Grade Aluminum plate in our boats. A lot of builders use 5052 because it can cost up to 20% less. But 5086 is much stronger and more durable. Even our custom 3"x 5" IMS lifting strake extrusions are made from 5086 Aluminum. All of our parts are also cut on a CNC router machine because of the higher quality surface edge is provides. Water or plasma machines often leave a very porous edge surface, which can lead to micro voids in the welding process. With many of our competitors looking to build at the lowest cost it often means they sacrifice the quality of the materials they choose to use. We look at it differently. If quliaty is a pillar of your brand then people will choose it for its known quality. Our quality is our difference and will always be a core to who we are. We spend hours daily looking at our materials and components. Always looking for the best materials and parts, which compliment the heavy built nature of our hulls. A typical delivery of router cut aluminum parts. Before starting a new design we work through principles in naval architecture to ensure all our vessels have the correct structural design, proper LCG & VCG & TCG locations, and proper waterline. We also engineer all of the boats structural pieces to "egg crate" or interconnect. That is to ensure a perfect fit and add rigidity to the platforms. Every piece of aluminum in the boat is engineering to be used in a specific location for a specific function. Each part is purpose built. Our employees are the best and brightest in the industry. We have assembled a team of people who are highly skilled and highly educated in what it takes to build a high quality product that will last for generations while being used in some of the toughest situations. 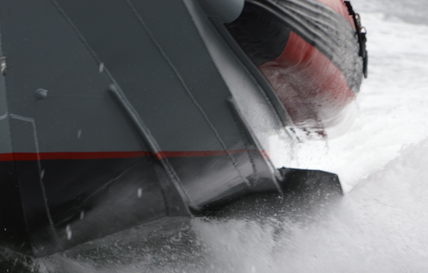 Our boats are built tougher because they are driven harder. We choose to build our boats on a hull jig because it allows us to keep the hull plate extremely straight and true. The hull is the foundation that influences how the boat handles, drives, feels, and performs so it is critical that is straight and true to shape. Using a series of interlocking frames we reinforce the hull plate so that is can handle extreme slamming pressures. Running longitudinally down the center of the boat you will find two full height frames. These frames create one of the strongest known beam designs known to structural engineering; an I-Beam. This I-Beam design disperses the stresses from heavy slamming loads. Safety is paramount to what we do, and we incorporate as much as possible into our boasts to ensure you stay floating if you take on a wave or breach the hull. Some features we incorporate into every include our collar system, self-bailing decks, and foam placed inside the hull. On every Life Proof Boat is our collar system which alone makes the boat virtually unsinkable. The collar runs the entire length of the boat and works to stabilize the boat the very moment it comes into contact with the water. It's like a life jacket for your boat. Our self-bailing decks are passive and work purely through gravity. With our design, a deck completely filled with water will clear in under two minutes. 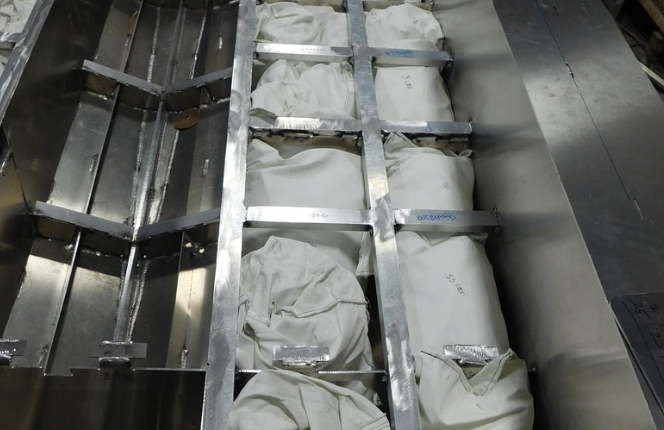 We fill every void in the hull with FR bags filled with the same foam used in our collars to further increase flotation in the event of a hull breach. There is so much flotation, in fact, that our small platforms contain enough displacement to float twice the weight of the boat. The foam we use is no typical foam. The EPE (expanded polyethylene) foam provides over 60lbs of flotation per cubic foot. It is extremely lightweight, absorbs virtually no water, is resistant to chemical and fuel exposure, resists impact and has excellent shape memory. Bow Pulpit: Integrated under the bow door is an anchor locker system with anchor pulpit / roller. The anchor locker is self-draining and can be configured with an integrated windlass. Performance Fins: With Inventech Marine's performance fin, located below the collar the boat stays flat in the corners. They provide unmatched performance and greatly reduce heal in corners. IMS has developed and integrated a Fwd. Canard in the shoulder of the vessel for additional safety and performance in mixed sea-state cornering. Bow Door: A manually lowering bow / dive door with folding / ladder is a clean and simple integration providing greater operational capability. No maintenance design and easy to use over-center locking safety latch secures the door during normal operation. Provides easy beach or water access.